This site is being revamped. Sorry for any inconvenience. The forum continues and contact can be made via e-mail. Apologies for being offline due to programming problems. Normal service now resumed. This site is dedicated to the memory of Marion Ross who was murdered in her home in January 1997 and who has often been forgotten in the wake of the extraordinary chain of events that followed from her death. The ‘Fingerprint Inquiry Scotland’, which reported in December 2011, completely vindicated Shirley McKie’s fight against experts who wrongly identified a fingerprint as hers in 1997. Since then her father Iain McKie has campaigned for better expert evidence in our courts. Part of his campaign is a paper entitled ‘Expert Evidence: Reliability and Relevance’ in which he argues that that forensic and other expert evidence is not always being effectively processed in our courts. This brings with it the danger of miscarriages of justice. The case of Shirley McKie raises some very serious questions about the criminal justice system in Scotland. As one of Shirley’s local members of the Scottish Parliament, I first became involved in this case as a result of the BBC Frontline Scotland documentary and at the request of Shirley and her family. There can now be no doubt at all that the evidence offered against Shirley by the authorities at the time of her trial was false. There were no possible grounds for believing that the fingerprint at the crime scene was hers. That has been attested to by finger print experts from across the world and I know how grateful Shirley is, in particular to London based expert Allan Bayle and to American experts Pat Wertheim and David Grieve. 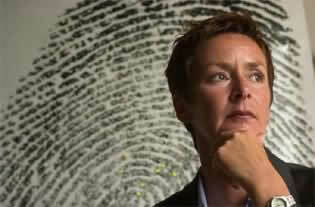 They have described her case to me as “the talk of the whole international fingerprint community”. Their determination to bring forward the truth has been of great importance in the whole case. Over recent months and years both Shirley’s father, Iain, and myself have written on many occasions to the Lord Advocate (Scotland’s Chief Prosecutor) and to the Scottish Justice Minister . We both became increasingly frustrated at the total lack of response to our enquiries. Throughout this case, it has become obvious that political pressure coupled with media attention, are the most effective weapons when democratic institutions become arrogant or defensive. I am still concerned that the oppressive and unjustified police behaviour against Shirley at the time of her arrest and subsequently has not yet been explained, still less apologised for. Responses to me from Strathclyde Police have been evasive and unsatisfactory. There is also little sign that the question of possible perjury by witnesses at the trial is being seriously addressed. Nor is there any official willingness to acknowledge that Ms McKie suffered unjust treatment at the hands of the Scottish Criminal Records Office. Without an apology there can be no real acknowledgement of what has actually happened, nor any real possibility of moving forward. In addition there must be substantial concern, given what has discovered over the past months and years, that there may be other cases in which SCRO has dealt with tainted evidence. Shirley has shown a great deal of dignity throughout her ordeal. That ordeal has resulted in the loss of her career, endless personal suffering and real persecution. Her courage and fortitude have been remarkable. The Police, the Prosecution Service, SCRO and the government owe her an apology, recompense and a promise that her suffering will not be inflicted on others. They must also change their procedures and, if necessary, their personnel so that there can never be another case like this. None of us will rest until justice has been done and seen to be done, and that will require much more in the way of action from the public agencies and public officials. None the less I am confident that her persistence will be rewarded soon. I am proud to have been able to work with her and her father and family, though I regret that such work has been required in a modern nation that is supposed to be based on the rule of law.